How long should a restaurant critic wait before reviewing a new restaurant? Reviewers should write about restaurants as soon as they open, instead of giving them time to find their legs. Why should restaurants get a free pass for the first few months after opening? This sped-up review schedule is widely seen as a grave ill among professional reviewers. A restaurant supposedly takes time to find itself, and its opening weeks can be a time of trial and error during which the intricate craftsmanship of applying heat to food syncs with the delicate artistry of placing it on a plate and bringing it to a table. It’s unfair to subject a restaurant to criticism during this period of midwifery, the argument goes, because it hasn’t yet blossomed into its full potential. The idea of giving a restaurant time to mature before you review it suggests romance, generosity, appreciation for serious artistry. And like most holdovers from the bygone glory days of print publishing, it’s a notion whose time is long past. There are plenty of reasons one might be sympathetic to the old-school line of thinking, but nearly all of them overlook the critic’s primary concern: the reader. A review isn’t meant to be part of a restaurant’s optimized marketing scheme; it’s meant to inform the public about goods and services they might, or might not, be interested in spending their hard-earned money on. Why would a restaurant deserve a more friendly review timetable than any other form of leisure or entertainment? Sure, there are a lot of moving parts to account for in a restaurant—but couldn’t that be said of a film, album, or book as well? You wouldn’t review a movie or a record before it’s been edited, scored, and color-corrected, you might argue, so you shouldn’t review a restaurant before it’s fine-tuned its act. But this argument ignores the fact that we—both the public and members of the media—review early drafts of various art projects all the time. The leak of a demo from a prominent artist is now regularly dissected as if it were a finished release. How would buzz spread for books or movies if the people reading and watching rough drafts of them weren’t writing about them? There’s an entire industry built around speculating about and commenting on every image, clip, and bit of news to come out about a film months before it’s been finished. And how often is a TV showrunner given time to “find his voice” before the critical pile-on begins? This is why in most media, artists have the good sense not to release their product until they’re 100 percent ready. Bands and comedians, for example, test out new material on the road before committing it to record. Movie studios hold audience screenings before making final changes. Once they’re confident that they’ve done everything in their power to perfect the product, they will offer it up to the world at a reasonable price. Granted, the choreography of running a restaurant may present some unforeseen challenges, but not that many. 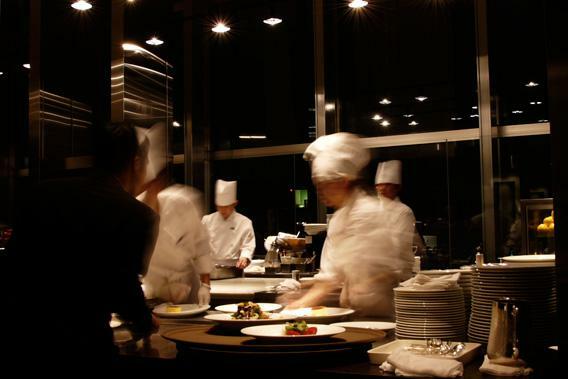 The nuts and bolts of the operation—the composition of the dishes, the competence of the waitstaff—should be figured out by the time the restaurant’s door opens. It’s not as though opening night is the first time the chef and team of cooks have cooked, or the servers served, or the bartenders mixed drinks. Presumably they’ve been doing it for years and are well-qualified professionals. You wouldn’t expect your favorite sports team to suddenly forget how to throw a ball just because they’re playing for the first time in a new stadium, would you? And if they did, you can bet sports writers would give them hell for it. Perhaps the best parallel to the restaurant industry for our purposes is the world of theater. Most plays and musicals offer previews to paying audiences to give the cast and crew a chance to work out the kinks of a production. There has been pushback against critics’ self-imposed prohibition on writing about theater previews for a while now, because previews, like delayed restaurant reviews, don’t make sense. Why shouldn’t an early performance, or meal, be subject to judgment? People are paying full price for it. Is the money of the first few hundreds or thousands of people to buy a ticket or make a reservation worth less than the people who see a play or visit a restaurant after it’s hit its stride? There are two functions of criticism: to inform the public, and to write for writing’s sake. The latter is great—who doesn’t appreciate reading a beautiful essay about an old film or book?—but it should take a back seat to the former. A struggling new restaurant may turn into the city’s most beloved establishment after a few years, but the fact that it opened poorly is news that diners have a pressing interest in knowing today. And a place that opens immediately running on all cylinders is newsworthy as well. Withholding either piece of information out of a sense of critical noblesse oblige seems like a dereliction of duty. No doubt industry professionals will line up with a dozen reasons I don’t know what I’m talking about here. (For what it’s worth, I worked in and around the industry for about 15 years, as a dishwasher, server, bartender, and critic.) But overall, readers’ hunger for news about restaurants is a boon to the industry. We’re living in an era that affords unprecedented attention and celebrity to chefs and restaurateurs. Chefs can enjoy rabid public interest in their restaurants, or they can protect their privacy until they’re ready to unveil their creations, but they can’t have it both ways. “Restaurateurs, chefs, and line cooks will tell you that the quality of the food served can vary by time of day, freshness of ingredients, whether a kitchen is fully staffed or not, how many diners are currently being served, and a dozen other factors,” Sietsema writes. “A place that usually deserves three stars can have a one-star day, and vice versa.” This is true—but it’s true whether a critic visits a restaurant once or three times. One critic’s review is never going to be an objective qualitative judgment; it’s just the summary of a series of impressions. And if you’re not ready to let critics form impressions about your restaurant, then maybe you’re not ready to charge full price for what you’re selling. Why not take a page from the (increasingly rare) theater practice of discounting preview tickets, and sell food and drink at cost until you can officially declare your business open for real? It sounds like a win for both the sensitive restaurateur and the paying public. After all, no one is going to complain about a free lunch—or a discounted one, anyway.